It turns out that Scott wants to have his cake and eat it too – a decision that serves to effectively inhibit Prometheus from ultimately delivering on its glorious promise. Prometheus begins with a graceful flyover of several gorgeous Earth-like landscapes. A mysterious humanoid figure stands silently before a spectacular waterfall, looks towards the heavens in an almost ceremonious manner, and then downs some mysterious gooey black stuff. Almost immediately, his body physically breaks down from within, and he falls into the rushing waters below. We are witness to his body fragmenting into the very DNA of life within the river’s currents. 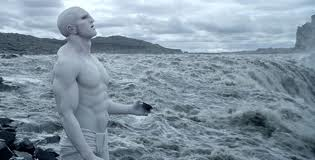 Prometheus begins with such formidable austerity that we are immediately hooked. 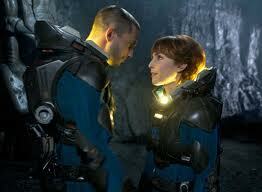 From there, we are introduced to Elizabeth Shaw (Noomi Rapace) and her lover Charlie Holloway (Logan Marshall-Green). They are archaeologists, who discover an ancient cave drawing and uncover the link to other ancient drawings from other cultures. This leads our scientists on a mission to follow these drawings and meet the creators of these “star maps” – ostensibly, our makers. During this long voyage, the crew is placed in hypersleep and under the watchful eyes of the android David. Michael Fassbender’s performance as the android David is one of the film’s fully realized highlights. While David methodically performs his assigned duties as an android, there are early hints of self-realization and something else afoot beneath his façade. This first section of Prometheus is beautifully set up, and the intrigue of what’s to come is genuinely inspiring. There are so many questions at play, yet the film smartly navigates its narrative, choosing wisely to imply – rather than to directly address – its deeper levels of meaning. 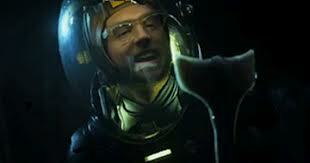 However, once the crew is awakened from hypersleep, Prometheus quickly begins to falter. The pacing stumbles in an attempt to fit it all in, the narrative includes too many almost-Alien coincidences and ultimately, the film reveals its symbolic yearnings too literally. 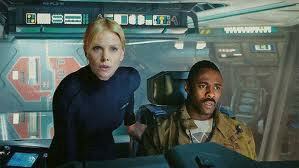 We meet Meredith Vickers (Charlize Theron) from the Weyland Corporation, and Janek (Idris Elba), the ship’s captain, as well as several other crew members. But rather quickly, their interactions require a real suspension of disbelief. We wonder how a mission of such an investment (Vickers cites a cost of a trillion dollars) could involve such reckless crew members. In the original Alien, the crew was on a mining job, so we expected blue collar miners, who were not trained in science or military procedures. Prometheus involves scientists and therefore, we anticipate cooler, more considered minds to prevail. Upon landing and discovering a mysterious mountainous structure, however, one crew member won’t even consider safety or security before getting outside, saying “It’s Christmastime, and I want to open up my presents.” And without question, in the very next shot, the crew is suiting up to go outside. When entering the mysterious alien caverns, one of the archaeologists decides to take off his helmet before properly checking the potential dangers of the environment. Even worse, when discovering an eel-like alien, one of the crew members decides to play with the creature – to his demise. Admittedly, some of these moments are minor, but after such a beautiful opening, they feel illogical and rushed. And little by little, these lapses in logic and pacing erode our credibility, as well as much of the tension within the story. So, Is This a Prequel to Alien or Not? In addition, Prometheus’ story is chock full of references to the original Alien that simply feel forced. Ridley Scott and James Cameron (the visionary director behind Aliens) were originally partnered on a potential return to the Alien universe in 2002. Unfortunately, the horrendous AVP crossover films got in the way. 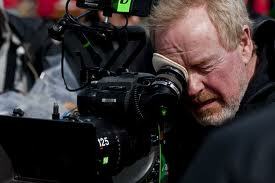 Scott returned to develop an Alien film in 2009, but then clashed with Fox Studios over the choice of director – Fox Studios would only go there if Scott was directly behind the helm. 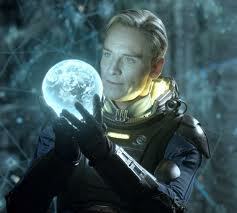 Ultimately, Scott agreed to direct Prometheus, but even so, there were creative differences with the film’s direction. As an example, Jon Spaihts’ original screenplay reportedly established the overarching concept of mankind searching for its maker, but its story was a direct prequel to the original Alien. Apparently, Scott was wary of repeating himself, so screenwriter Damon Lindelof was brought in to re-write details and essentially uncouple some of the direct associations with the Alien universe. These creative negotiations during Prometheus’ development are very telling, as the final execution sometimes plays like more than one film. Scott wants to pursue an original story of adventure and discovery, yet he also feels the need to explain its relationship to the Alien universe. In Prometheus, the crew arrives on LV-223; in Alien, the crew visits LV-426 – it’s not quite the same moon, but oh, so close! In Prometheus, the crew discovers a C-shaped spaceship that will end up crashed on the moon’s surface by the film’s end; in Alien, the crew enters a massive spaceship in the shape of a C – looks the same, but it’s not the exact same spaceship? At the end of Prometheus, the Engineer is attacked and dies in the shuttle, but had he “survived” and made it back to the spaceship, he might have even served as the same Engineer discovered at the beginning of Alien. But alas, it was not meant to be. If Scott really wanted to distance himself from Alien, there was no need to even create such odd similarities. They play exactly like Scott’s promotional comments about Prometheus’ connection to Alien – coy, but using technicalities in order to mislead us. Worse yet, many of these connections do not necessarily enrich the Alien world. They simply explain – in a very literal way – some questions that were best left unexplained in the first place. One could argue that Scott is strategically creating a bigger universe (ie, similar moons/planets, similar alien ships, etc). However, it all seems ultimately immaterial to the heart of this Prometheus story, as to make one wonder why Scott even bothered. Most critically, however, the execution of Prometheus’ symbolism is handled much too literally to create intrigue. One simply needs to start with the film’s title. 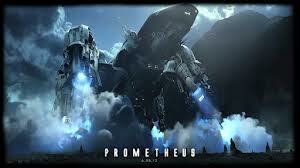 Prometheus is the name of the spaceship in the film. In Greek mythology, Prometheus is the trickster, who created man and stole fire from the Gods to support man’s progress. As Scott is exploring the ultimate origin story, his film’s title seems to refer rather pointedly to the Greek myth. In addition, Shaw’s (Noomi Rapace) story involves her wonderment of faith. In a truly horrifying moment, she is told that she is pregnant… by six months. Given the reason behind her pregnancy, this discovery would be disturbing in its own right, but Scott insists that her background should also include the revelation that she cannot bear children. It also doesn’t help matters that the setting of the film is Christmas (to be sure we don’t overlook this detail, a crew member tells us it’s Christmas… while he’s decorating a Christmas tree). No matter how you play it, the barren female, who can now bear a “child” at Christmastime is just too much. In addition, when Shaw and her colleagues discover an alien corpse within the structure, the gee-whiz technology quickly estimates the corpse has been there for approximately 2000+ years. One has only to back track through humanity’s religious history to make a correlation with the birth of Christ. These Christ-like references might have been intriguing if handled with more subtlety, but Scott continuously insists upon making sure that we “get it” through the dialogue, and in the end, his film’s emotional potential suffers significantly because of this literal approach. But even with all of these shortcomings, Prometheus presents us with so much to admire. The film is big, bold, and beautiful. Scott is exploring intriguing concepts about intelligent design and the origin of human life, and he has created a fabulous cinematic canvas in Prometheus with so much awe and wonder. In addition, Scott’s production design is beautifully rendered. From his very first film, The Duellists (1977), Scott’s impressive visual compositions, as well as his precision and attention to detail, have been extraordinary strengths. Few filmmakers can even approach Scott’s talent for creating fully-realized worlds – and Prometheus is no exception. From those opening landscapes of an Earth-like planet, to the details and soft glow and hum of the ship’s electronic instrumentation, to the beauty and horror of the alien planet, nothing is left to chance with Scott. It all looks and sounds simply gorgeous. And what about the scares? Scott can still elicit chills from his audience and pull off shocking moments of terror. In one of the film’s most disturbing scenes, we are witness to an abortion the likes of which we are not likely to see anytime soon! The scene of Shaw struggling in the medical chamber to abort her alien fetus and save herself will probably stand as the film’s single most sensational moment. It manages to simultaneously shock us with its imagery, horrify us with its implications, and then intrigue us with its symbolic undercurrents about life and the taking of life. In this scene alone, Scott proves that he has not lost his touch – it’s that good. In the end, Ridley Scott’s Prometheus is a missed opportunity for cinematic greatness. Scott continues to prove he is the ultimate visualist, but his execution in Prometheus falters in surprisingly sloppy ways, especially with the story’s pacing, the characters’ logic, as well as the handling of the screenplay’s overt symbolism. 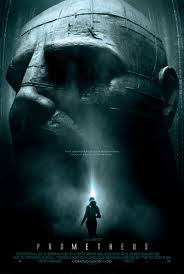 Ultimately, I appreciated Prometheus more than I liked it – but I still liked it. And Scott? Does this affect his standing as a visionary? Absolutely not – he is still one brilliant and visionary filmmaker!